In my last podcast (Impatient for Growth) I mentioned my frustration at Apple’s slow entry into emerging markets outside of China. I cited Tim Cook’s comments that he did not see an opportunity there in the short term. He mentioned the multi-level distribution challenge which I took to mean the difficulty in setting up Apple stores (in itself due to restrictions on foreign owned retail chains) and the absence of device/service bundling. This requires more analysis and the best place to start is to look at the data available. The market potential is enormous. Globally, there are 6 billion mobile cellular subscriptions (end of 2011, ITU) and 86% penetration, but only 1 billion have mobile broadband subscriptions (which make ownership of a smartphone worthwhile). In India there are 893 million subs (vs 986 million in China). In 2011 142 million mobile cellular subscriptions were added in India, more than in the Arab States, CIS and Europe put together. So the potential and growth are spectacular. But that is just 2G. Mobile broadband (i.e. 3G) is rare. Globally, developing countries have only 8% mobile broadband penetration vs. 51% in the developed world. Mobile broadband is a proxy for mass adoption of the iPhone (though perhaps not for Android inasmuch as it’s employed as a feature phone). 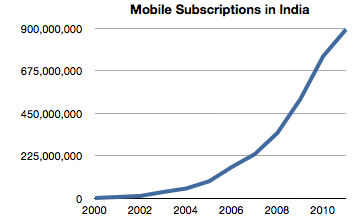 The situation for 3G in India is even worse than the overall developing world. 3G licenses were only first awarded at the end of 2010 and the process was fraught with allegations of corruption. In the year and a half since, there came to be an estimated 10 million HSPA connections in the country. The potential therefore is huge but the timing is difficult. Analysts are projecting 100 million mobile broadband connections by 2014 and over 350 million by 2016. Apple can affect this rate of growth as it’s not only enabled by the network roll-out but can affect the take-up rate by consumers. It’s a chicken-and-egg problem. No network means no devices but no devices may mean the network cannot be paid for. In the initial phases, the economics of mobile broadband are still dominated by the incentives for operators to pay for the infrastructure rather than for consumers to pay for the service. The iPhone will have a role to play and the question is whether 2014 or 2016 are the dates when Apple will be able to claim that they’ve cracked the India code.